This guide will help you beat Hello Neighbor acts 1-3, and the act finale. When the cutscenes are over, go to your house, and get 3 closed boxes. Go to the yellow shelves in the neighbor's yard, and stack the boxes. Jump to the platform, and use the last box to break the window. Take the giant flower picture, and grab the car key. Unlock the car, and then get the magnet gun. Go back to the second floor, go through the hole in the wall, or the door, (if you unlocked it with the yellow key). The next door, is locked with a chair, so look through the keyhole, and look at the red key. Put the magnet gun in your hand, and have it half through the door. It'll take a minute or 2, but you'll end up magnetizing the red key. Unlock the basement, and wait for it to load. The washing machine is a secret door. Go through it. Open the next door. Jump through the open window, and open the gate to your right. Go through the basement, and ignore the doors. You'll soon find another gate. 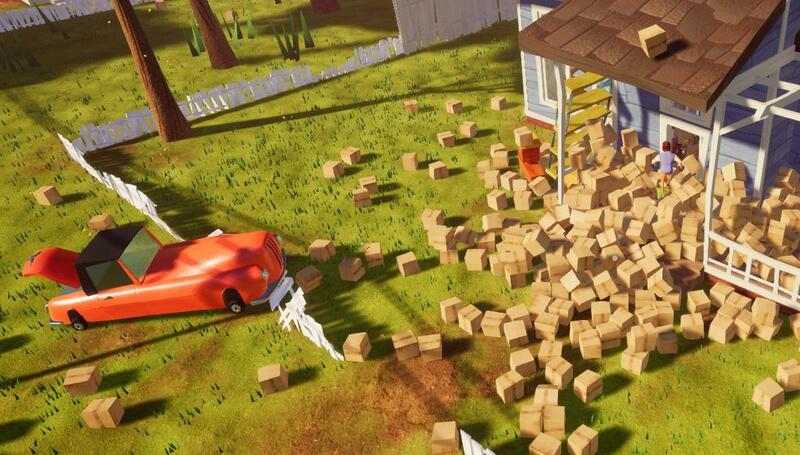 Open it, and use the picture of the player's house from the beta as a ramp, throw an object at it, and it'll make a ramp. It may take a few tries. Turn on the generator, and climb up the objects. Break through the brick wall, and go through the door. Open the gate, open the door, and run away from the neighbor. Let the neighbor catch you when you see a door with a ton of locks on it, doing this will take you to act 2. You wake up in the basement. Wait for the cardboard cutout to open the door. Go through the vent, and climb the ladder. Find 2 switches outside, and 1 switch in the living room. Go to the kitchen, open the freezer, and grab the wrench. Open the locked ladder with that. Also grab the valve. Stack boxes to the gate of the ladder, and put the valve on the pipe on the yellow room. It'll drain the shark water. Grab the shovel in the shark room, and dig the patch of dirt outside. Pick up the key. It's used to open a doll house on the second floor. Open it, and open the door to the bathroom. Open the real bathroom door in the neighbor's house, and grab the Lego guy. Put him in the doll house bathroom, and go back to the real bathroom. There will be a big version of the Lego guy. Take the crowbar out of his hand, and take the boards off the fence. The boards are near the neighbor's porch. There will be 1 more cutscence, and it'll take you to act 3. You wake up in your apartment. Pick up the letter when you hear knocking at your front door. After the cutscenes, pick up the key in the trunk of your car. Open the front door to your house, and wait for the phone to start ringing. There is a secret cutscene at the remains of the neighbor's house. After the cutscene with the phone, you'll wake up in your house from act 1. If you played the beta versions, the house looks just like the one from beta 3. There are a few differences. If you never played the betas, i'll teach you how to beat act 3. In the neighbor's backyard, there is a switch. Flip it, and break the window next to it. Climb the ladder, and jump to the train tracks. Go to the area whre the mannequin is, and go down the hole. Flip the switch, and then press the red button. The train should start going. Let the neighbor catch you, and it'll be daytime. Go upstairs, and jump to the light, and through the gap at the jail cell. Throw some stuff at the golden apple paintings, and 1 of them opens the big golden apple painting. Go up to the no gun room, and open the door to your right. Glitch a shoe into the box with the lever inside. It should open a box next to the giant horn. Pick up the red key, and close the painting. When it's open, the neighbor has free run of his house. Climb back up the elevator again, assuming that the neighbor isn't climbing it, and climb it. Jump on the train, and make the train go backwards. Then stop the train at the area with ladder. You'll need a wrench to open it. Jump to the pipe, and jump on top of the train. Then, jump to the roof. Go down the ladder, and pick up the wrench. Open the ladder. Open the painting again, and go through the no gun room once again. go through the door to your left, and there will be another door. remove the chair, and open the power box. Pick up the crowbar. It's too hot to touch, so you'll need the magnet gun. Drop into the room, and pick up the umbrella. The umbrella's purpose is to float around. Without it, you'll fall and respawn back at your house. There is a secret code you can use, and it's somewhere in the neighbor's house. The code is 2369. Go back to the jail cell, and open the door to your right. There's a room with no floor. Jump to there, and glitch a painting into the room. The switch might activate, opening a secret wall to your left. Grab the magnet gun, remove the chairs, and magnetize the blue key. Open the gate, and grab the yellow key. It's in a pile of boxes. Remove the chair to your right. Turn off the neighbor's camera system. Find the blue and yellow padlocks. Go into the blue key room, and throw something at the switch while standing on the lift. Open the door. You'll be in the first minigame. When you are getting chased by the mannequins, crouch and stay still. You'll go invisible to the mannequins. If you move while you are invisible, you are no longer invisible. Look what's in the other mannequins' shopping carts, and find them, and place them in your cart. When you got all 5 items, proceed to the checkout. Go to the exit door, and you'll gain the first superpower. You'll get the invisible crouch, which you used in the supermarket. Go to the roof, and go to the box that's hanging from the neighbor's house. Unlock the red padlock. You'll go to the second minigame. It's hard to explain, but you'll gain double jump aferwards. Grab a box, and double jump over the plants. Open the power box below you, and put the box inside. Go to the secret room that's barricaded with boxes. It's in the train station next to the elevator. Grab the green key, and open the green padlock. You'll go into the last minigame. Hide in the lockers to hide from the mannequins. The glowing mannequin is the teacher. It moves around while the students are at their desks. I know, it's tricky, but you'll get the hang of it. Magnetize the crowbar, and put it under a sink or a bathtub. Run the water. It'll cool down. Use the crowbar to break the boards on the basement door. Get a bucket, and fill it with water. Put it over the neighbor's stove, and turn it on. The bucket will get hot. Open the freezer, and splash the water all over the ice block. Do it a second time to melt the ice. Grab the keycard, and go in the basement. It looks just like the basement from act 1, right? Do the same things, and go through the crack in the wall. It's in the room where you had to go through the open window. Go to the area where there's a pile of objects, and use the invisible crouch. The shadow will walk past you. Grab the chair, break through the brick wall, like you did in act 1. Put the chair down far away from the metal fence, and double jump over the fence. Open the exit door, and keep pressing the space bar, and run down the hallway, where you were getting chased by the neighbor in act 1. The door doesn't have any locks on it, so open it, taking you to the act finale, or if you prefer calling it act 4. Look through the window, and let the giant neighbor smash the building, Just like beta 3. Double jump on the platforms, and press the red button, like you did in act 3 while turning on the train. Throw a box at the giant light switch. It opens the toaster. Jump on the flashlight and radio, and double jump into the toaster, like you did in the double jump minigame in act 3. Leap on the platform, and flip the light switch. Go to the smaller platform, and jump on the lift. Break the window, and flip the light switch. Quickly grab an umbrella, and float to the red house that the train smashed. Grab a candle, and light the firework and crossbow. Roll a baseball into the giant apple shooter, and jump into the toaster once more. Float into the house on the giant neighbor's back, and open the door. Find the exit in the missing poster room. Wait for the game to load, and you'll find the player from act 1. He will walk to the window, and panic as he sees the giant shadow. Find the young player's movement pattern, or watch a youtube video about it. When you complete it, look in the house, the neighbor will be in one room, and the shadow will be in the other room, banging on the door, go to the exit door, and the outro cutscene will play, as the player moves his boxes inside his new home. The weird thing is, the player only packed 2 books and an apple, and his key. The ending credits will show, and you beat the game.